It doesn’t take long to look at my food category to know that I am a huge foodie. Nor does it take long to realize my passion for food styling and how beautiful food can truly be. Whilst I love creating amazing things from scratch from my very own kitchen, I also have a soft spot for fine dining. Who doesn’t? Mr P and I love finding new restaurant to try out and there isn’t a type of food either of us doesn’t like. 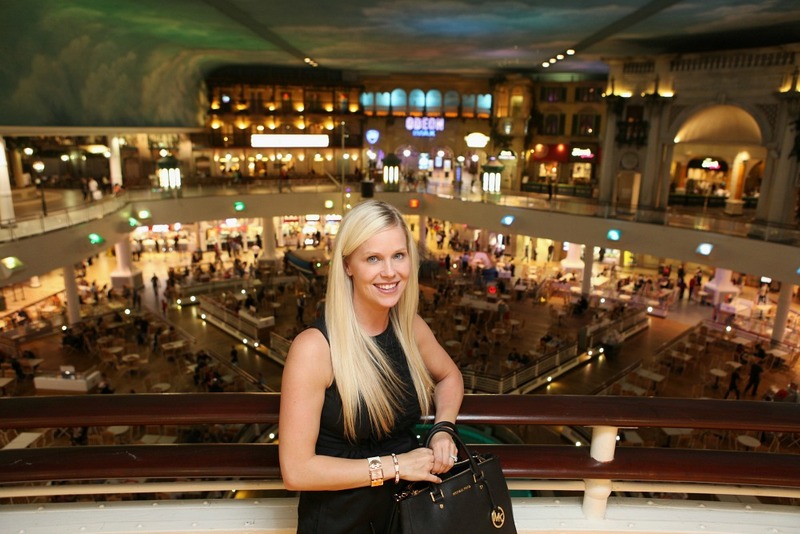 We have dined at the Intu Trafford Centre many times in the past so I am familiar with a lot of their restaurants. 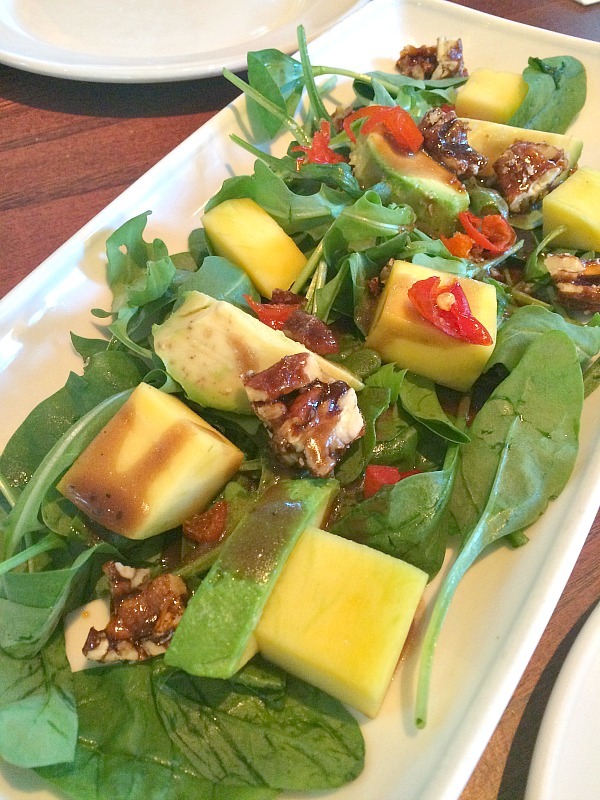 What I love most of dining there is that you can restaurant hop. We love having a pre-dinner drink at one and moving onto to another for my main meal and then another for desserts and after dinner drinks. It really has a great atmosphere and your options are endless. Being that there are so many to choose from there are many we haven’t been able to test out yet or ones where we have never ate at but have had the pleasure of their cocktails. 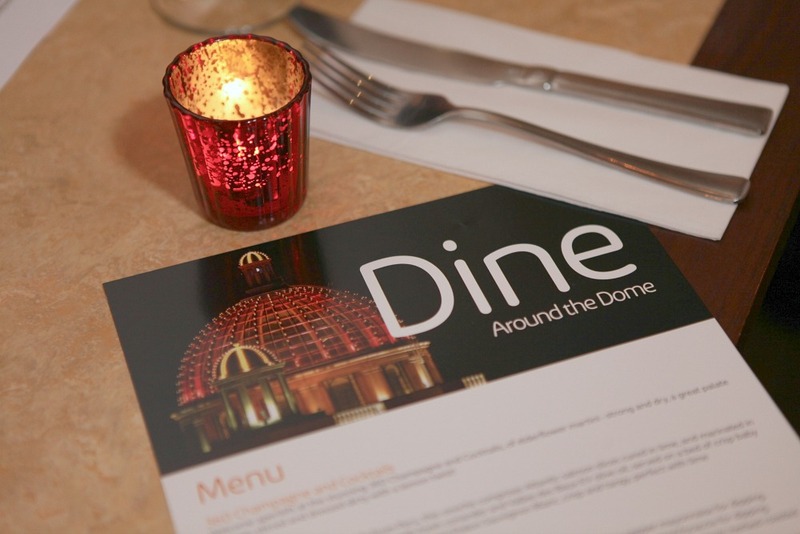 I was ever so excited to be apart of an amazing group of bloggers and attend the Dine Around the Dome this week at the Intu Trafford Centre to test the finest and see what’s on offer. We were greeted at 360 Champagne & Cocktails with an elderflower martini that was smooth, delicious and a new favorite of mine. It was a great way to meet and greet the rest of the lovely group that was attending. 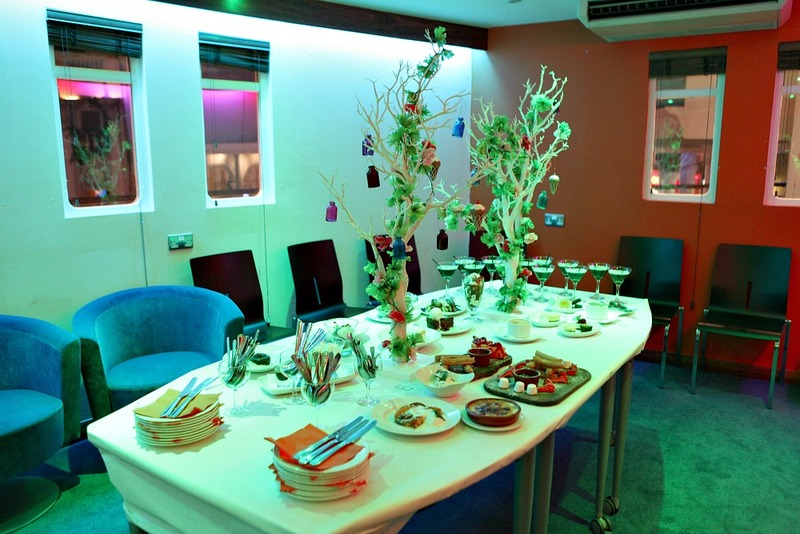 The 360 Champagne bar is a great place to have a social drink and meet friends at the mall. The views from it are beautiful and the bar is classy. Also great when a real life friend starts blogging and we get to attend events together. Had a lovely night with this beauty Jane from A Little Lyrical. We were then ushered to Cafe Rouge, a restaurant I was familiar with as we have taken the kids numerous times before. But as all parents would agree we choose different foods when we are dining with children than we would alone. I was blown away with the Ceviche de Saumon which had salmon slices cured in lime, and marinated in chilli, red, and spring onion served on a bed of crisp baby gem. It isn’t something I would normally order for myself but completely loved it. It was lovely to sip a crisp and tangy white wine called Saint Etalon Sauvignon Blanc that paired nicely with it. It was then time to dive in at Carluccio’s. The food on display was mouth watering and you almost didn’t know where to start. There was Pepolata Arancini which were a crispy fried rice ball that quickly became my all time favorite nibble on the table. Caponata is a Sicilian aubergine sweet and sour stew served with toasted focaccia. This dish surprised me the most as I was expecting it to be served hot and spicy and it was cold and sweet and more importantly delicious. There were rustic boards filled with Parma ham, Milano salami, herbed roasted ham, mortadella and fennel salami with olives, caperberriess and home baked focaccia. If that’s not enough to make you salivate I don’t know what is. 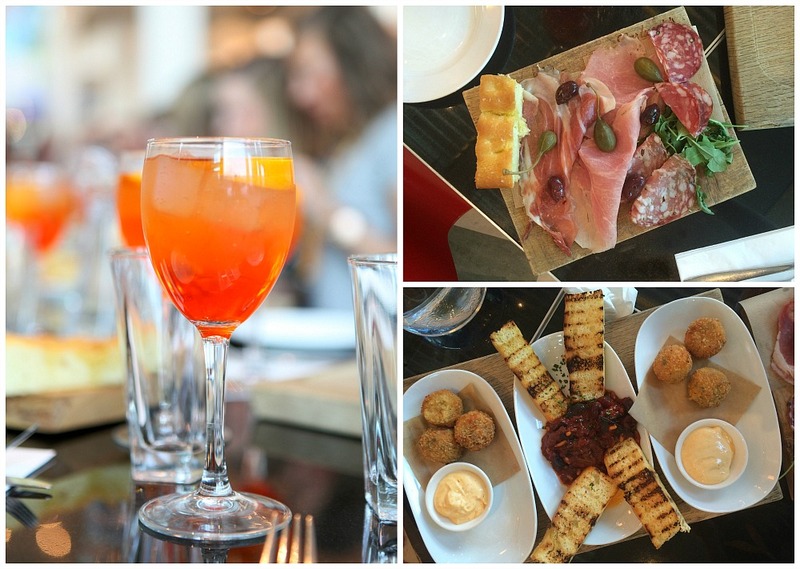 We were spoiled with a beautiful Aperol Spritzer to wash it all down with. Even though we had gorged ourselves at Carluccio’s we still had a night of tasting ahead of us. Next up was Las Iguanas. I have had drinks here before but never had the pleasure of dining here. My friend highly recommends this place so I was very eager to see what the fuss was all about. It definitely was a fuss to be mentioned over succulent foods. 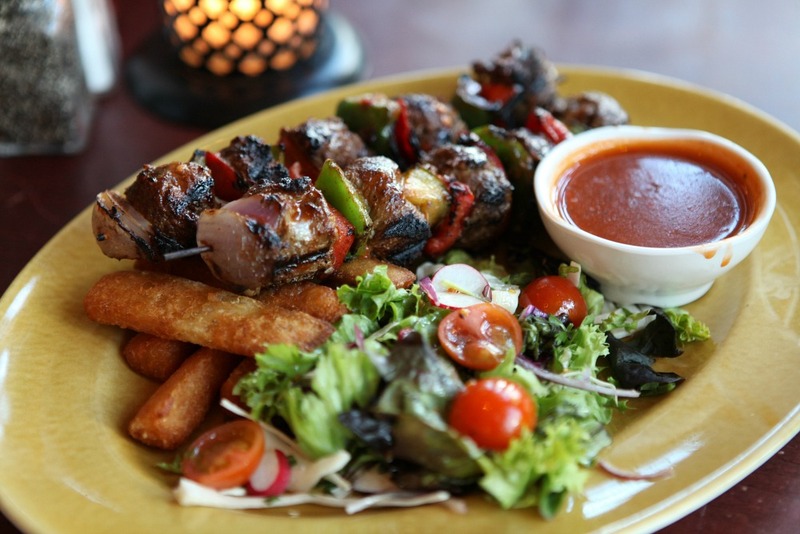 Las Iguanas definitely is a great place for friends and family alike to gather and order something different to share. The table was dressed with Empanadas, Churrasco Skewers, Manioc root cassava fries with salsa, Totopos which are Mexican spiced corn chips and salsa, Mango and pecan salad (a huge favorite of mine now) and Mango Collins to top of all off. If I didn’t have fear of no more room for the next few places we still had to visit, I would have sat there all night gorging myself in amazing flavors and combinations that made my taste buds jump. We all took a five minute breather and hopped over to Wokooshi. I love Japanese and Korean food but have never been to Wokooshi before. The restaurant is family ran and staff are super friendly. It was the first thing I noticed when we walked in. The decor of hand painted fish mirrors was stunning. 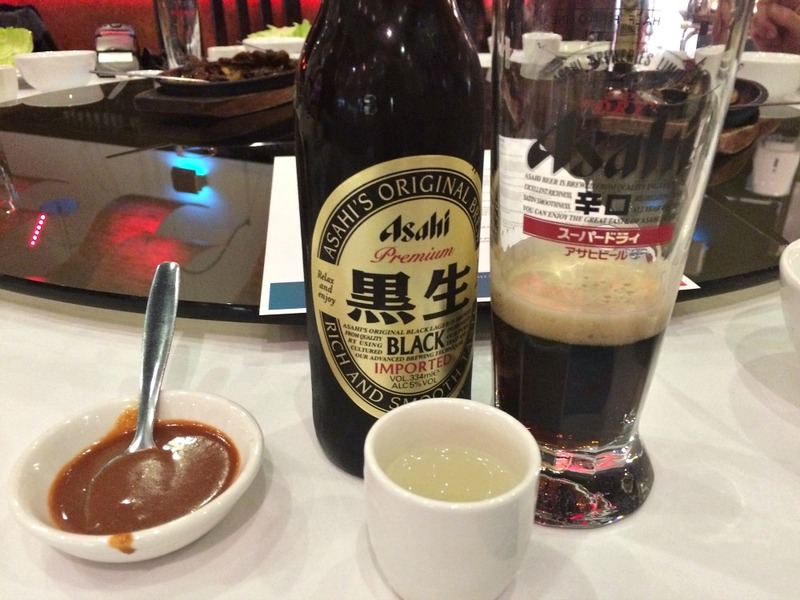 To drink I was mildly surprise that I liked the Asahi Japanese Black lager. It was not at all heavy as I anticipated. Of course, one must taste the Sho Chiku Bai Nigori Sake. It’s one of the oldest style of sakes around. The food was just as surprising as the drinks. We were served Beef Bulgogi. This dish is listed 23rd in the World’s 50 most delicious food poll. The Salmon Teppanyaki was up next and it did not disappoint. I would love to know exactly how to cook salmon like this as I would eat it everyday. Filleted perfectly, juicy inside and a crisp bbq-style outer layer – yum! 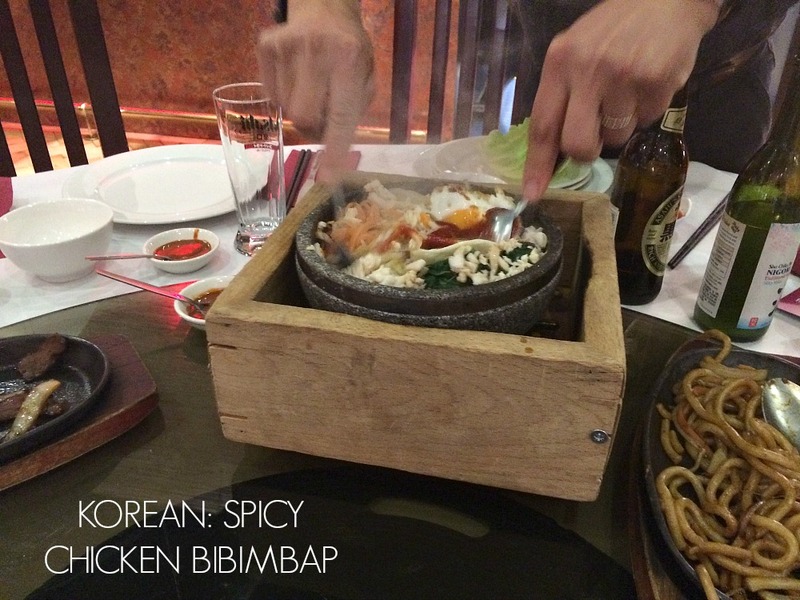 There were numerous dishes to follow including Sizzling seafood Udon Noodles full of scallops and king prawns then onto Spicy Chicken Bibimbap which is a signature Korean family dish with some many mouth watering ingredients mixed together in a hot stone bowl and topped with raw egg, it really does blow your mind. Wow, I know that’s a lot of food and drinks! Are you full just reading all this or is your mouth watering so badly you must go get something to eat! I feel the same just typing this out. The food were was magnificent. If you think that’s it … there is more. The night ended up in the Captain’s Table of Intu Trafford Centre. A place that celebrities have adorned and no public access is allowed. Where we all squealing with delight for our photo to be taken from the heavens above. If the view wasn’t enough to take in, we walked in to find a whole buffet of the finest desserts imaginable. There were coffee martinis on hand to wash it all down. 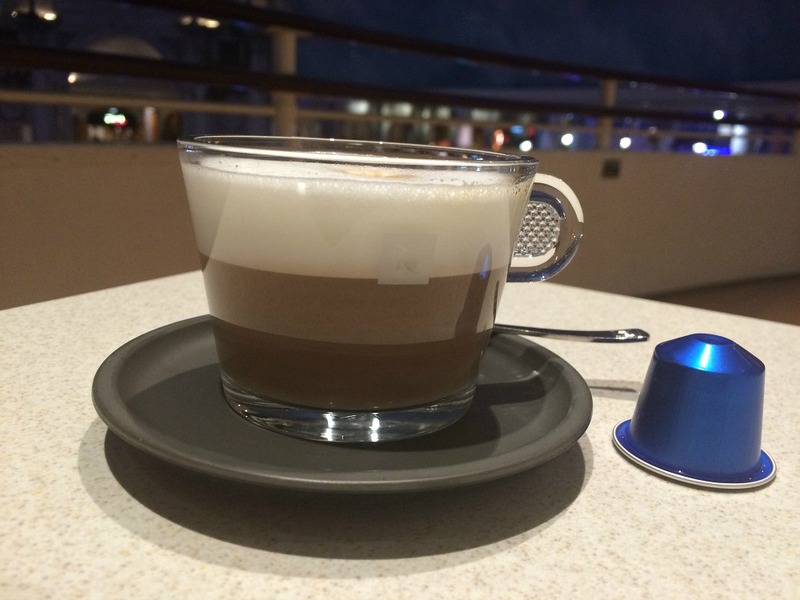 For those that were ready for their coffee nightcap the new limited edition Nespresso capsules were offered with a lovely coffee expert to share her knowledge. Forget about the drinks let’s go back to the desserts I hear you say.. it was a sea of sweetness. Boards full of churros, chocolate dipping sauces, and whip cream and cheesecakes adorned with berries and caramel sauce or lemon flavored, ice cream full of dried fruits, chocolate mousse layered with pecans and almonds, nutella sundaes and tiramisu wonders. The list goes on and on. What I loved about this amazing group of ladies was that we each got assigned a dessert to test and it wasn’t long before we were all just trying bites of each others and passing them on. It was a true sweet feast to end the night. I love attending these events and meeting other bloggers. It always leaves me feeling inspired and full of fresh ideas that these events have sparked something inside me again. I always feel like I come away from these events having made a friend or two too. That’s one of the reasons I love blogging so much and the community support you get from everyone. 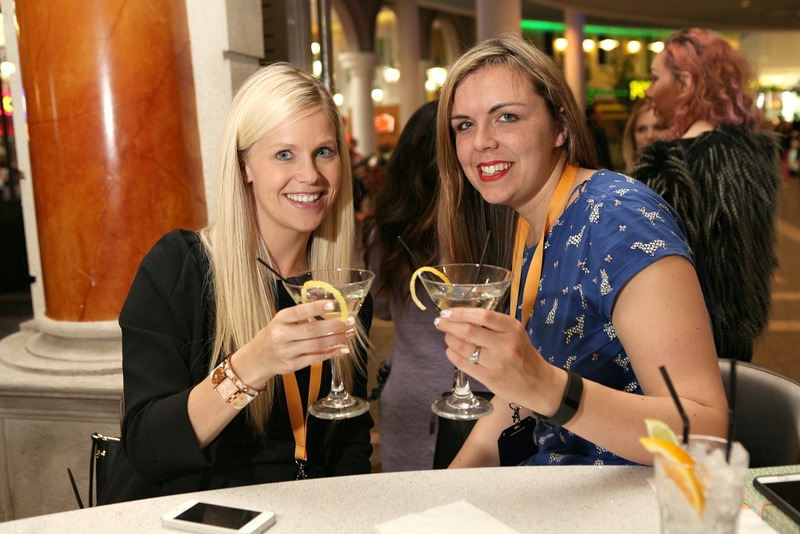 This event has really opened my eyes on the food available at the restaurants we frequent and the ones we have longed to try at the Trafford Centre. It’s great to have tasted so many dishes that I normally wouldn’t have ordered. I now know what I can recommend to friends and family when they go now. I definitely have a list of dishes for the husband to try the next time we are there dining out. This foodie was in her element this week amongst mind blowing food, elegant and smooth drinks and new amazing friends. 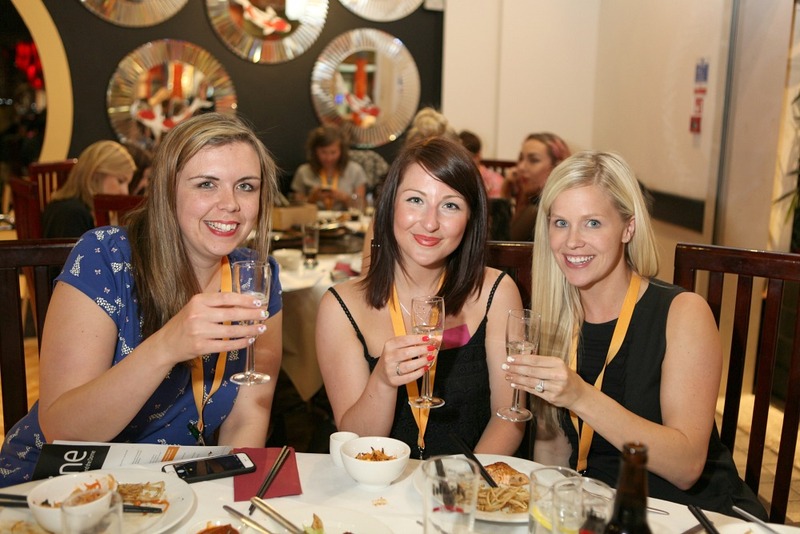 Thank you Intu for a great event and presentation from all the restaurants we attended. Thank you Jason Lock for some many great photos here. (some photos above are my own the rest are Jason’s magnificent captures). The PR ladies you have done a brilliant job of organizing such an enjoyable and amazing event. I had a lovely night – Thank you ever so much. OH Tracey that would have been so lovely. Darn it. Definitely next time. It was a great experience. Loved all the food too. Definitely one of my favorite places to go and eat with Mr P for date nights so we can restaurant hop. Yummy the salmon in lime and chillies sounds very nice and I think I really need to try Wookooshi! We love the Trafford centre and tend to go to the same places to have the same food so I think it’s time to venture a bit! We do too. While we loved going there for meals out and date night we really stuck to what we know and now my whole world has been opened and I have a huge list to try. Can’t wait to go back. Thanks Daniella it truly was divine to eat. It was my heaven too and I loved every second of it. I could do that every month. Thank you. OH yes those are great favorites and now I have new favorites to add to my list to take Mr P. We love going to the Trafford Centre for dinners out. OH I think we all are like this and get into our favorites and comfort zone and I probably would have stayed the same but now I know so many great dishes at each, I definitely am spoiled for choices and it will be hard to pick next time. Wow. It all looks amazing. Very very jealous! Thanks I am jealous and wish I could do it again. The food was truly SENSATIONAL. We have always had a love for it but usually stuck to our key favorites now we have so many new favorites to enjoy I can’t wait. Such a great place. Thanks Aby it was beyond scrumptious and such a lovely night with so many great bloggers. Really enjoyed it. Oh me too, I am probably there once a week at least and just been today in fact and it’s about an hour away for me. We used to live closer so I used to go even more. So much to do there with kids and families, shopping and eating out all in covered roof as the weather here isn’t that great to be in the city centre these days. I loved trying new dishes that I wouldn’t order myself scared to not like them and end up loving them so much so I know what to get next time. Oh yes definitely some amazing restaurants and all these we went to have great bars in them too for a good cocktail. 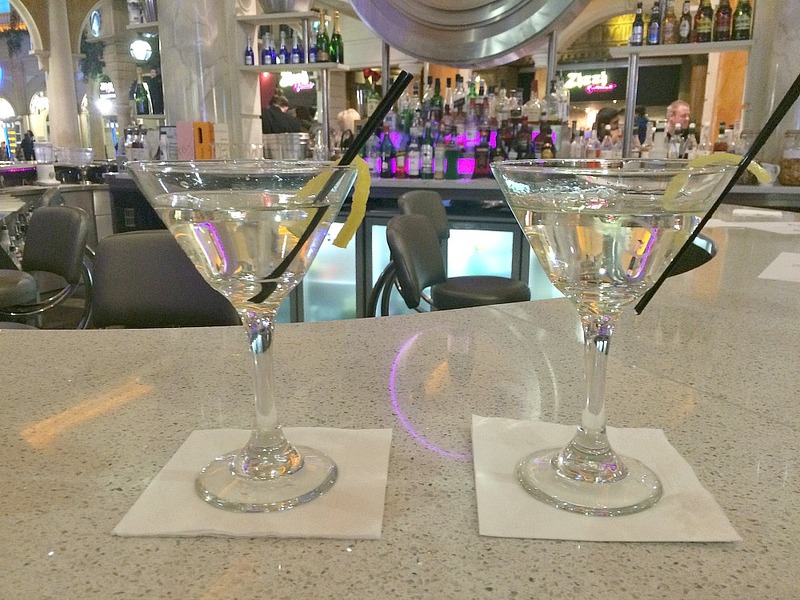 We restaurant hop for date night at the trafford centre all the time. They really were Louise. Nothing disappointed on this very special food fest evening. I was in heaven. Oh the dessert finale was amazing and really something to do just on its’ own I could have kept eating. lol Thank you. Wow you have been to Japan I bet its’ even better in its homeland of course. But it really was amazing here too. You must try it. So many great restaurants to choose from. It really was amazing. I loved every dish and every second of the whole evening. Great event put on and did not disappoint. So many places I want to go back again and try. I know it was amazing experience as I wouldn’t have ordered half of what I ended up loving. Thank you. OH you must try it out it’s one of my new favorites for sure. I really enjoyed the evening and I being a foodie myself I always have room for good food. Really, I am always there whether it’s shopping, eating or taking the kids to the movies. So much to do at the Trafford Centre. Of course, I have myself always at champagne darling. But the drinks and food definitely blew me away and I have so many I want to go back and take friends and family too now. This looks like such a fantastic place to dine! I love that there are so many options all in one roof! And the food, as you said, looks so mouthwatering. Yet another reason I want to vacation in the UK, for establishments such as these! Thanks for sharing, Jenny and for hosting us on #sharewithme. Have a fantastic rest of the week! OH yes there are so many great restaurants here and the food choices far more than back home for me too. It’s a great place to try all cuisines. Thank you Rebecca. It was a great night. It really was yum, yum Kiran and every time I come back to reply to someone’s comment on here I get hungry again. Torturing myself. Oh Suzanne you naughty girl you should have come, we would have had a blast together all evening and the food would have been worth every second of your travels. Next time event up north shout you can always stay with me darling. OH yes stay away from the fast food part of the food court and it’s always got space and time for you in the nicer restaurants. We often do date night there and love the atmosphere too. Me too, I am a save player when it comes to menus and places I love I stick with the same ones that never disappoint and I am trying to branch out more. But this was great to taste things I didn’t even know how to pronounce and find I loved them. Food really is the way to my heart so this was heaven to me. I felt very lucky indeed my lovely. Great company too. Couldn’t be more right there Jeremy. Food and drinks is the way to my heart. I love a good feast and friends. It really was a fab night of good food, drinks and friends. It was an awesome event and so glad I went. Truly enjoyed every minute of it. I know every time I come back to reply to a comment I get hungry. So amazing and the food was out of this world delicious. It was amazing Sara and I love a good feast with friends. I couldn’t say a bad word and so many places I want to go back to now. I love a good food night with ladies. Had such a great time and so many great dishes. Back to the kettlebells now. Oh yes we go on date nights and nights out there so easy to hop from one restaurant to the other. The food is amazing. Wow, it looks delicious. I think the next time I visit my friend, we should leave the kids with her partner, and we should go out to eat there. So much that I’d like to try. And looks like a lovely place to have a collection of restaurants too. Oh yes sounds ace idea. Its great food and a good atmosphere all day and night. Nice to hop restaurants too. A different meal in every room sounds amazing doesn’t it. You can’t beat a good food buffet either of various grub Lucas you are right buddy! Thanks. No I was good one sip per various drink and ate so much I don’t think it would have mattered. The food was truly amazing. Yes definitely didn’t need any breakfast the next day. So yummy though and worth every calorie ate. Thanks Sabrina. It really was a great event and always amazing to meet other bloggers too. I love the trafford centre looks like you had a great time. Thank you, it’s amazing there isn’t it. We go often. The experience was phenomenal. I am always worried to order something out there because one I am always hungry and two don’t want to waste it or the money if I hate it. But this way I got to test so many that I never would have but love it. It was a great experience for sure. Thank you. So happy we found your blog! It’s darling! You are darling!…and i want to eat that food right now! Looks amazing!! Thank you so much Krissy that means a lot..
Looks amazing! I will pay a visit next time I am there! Oh yes it’s worth it. Thanks. Thank you so much it was a fabulous night.